Every family has its dark corners, its sad secrets. My great-grandfather, Anselm Höber, was born in 1832 in the south German city of Karlsruhe, the son of a wealthy Jewish merchant. He was sufficiently well off that in his twenties he could afford to have his portrait painted wearing a handsome coat with a fur collar. At some point, Anselm moved to the city of Stettin in Pomerania, then a province of the Kingdom of Prussia. (Much of Pomerania was annexed to Poland after World War II and the city is now known as Szczecin.) In 1865, Anselm married the beautiful Elise Köhlau, and at that time converted to his new wife’s Protestant faith. 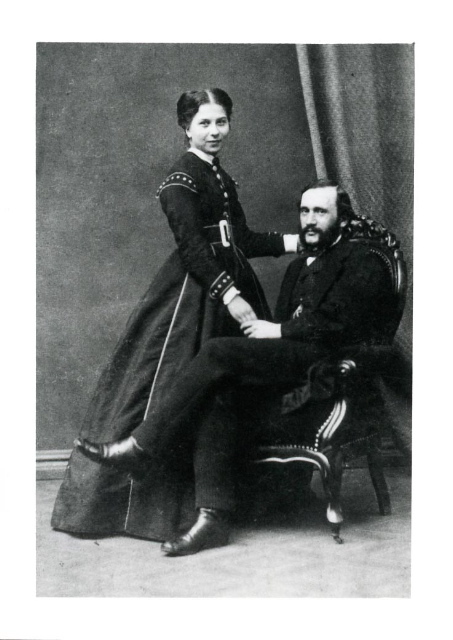 Anselm Höber and Elise Köhlau around the time of their marriage in 1865. In Stettin, Anselm was a successful businessman, and soon owned a controlling interest in a large moving and storage firm. 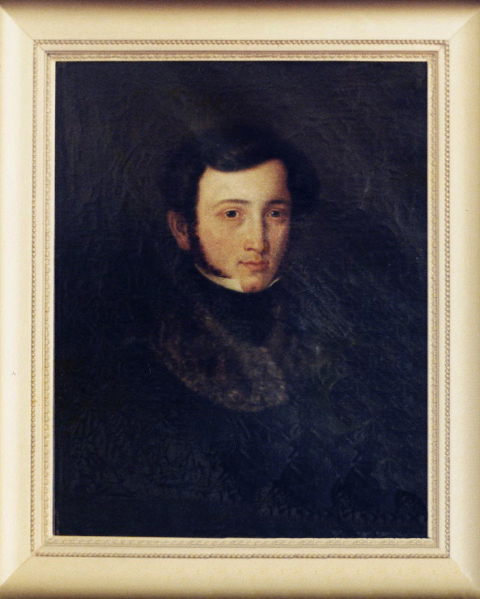 The couple had three children, Eduard, Rudolf (my grandfather) and Lili. 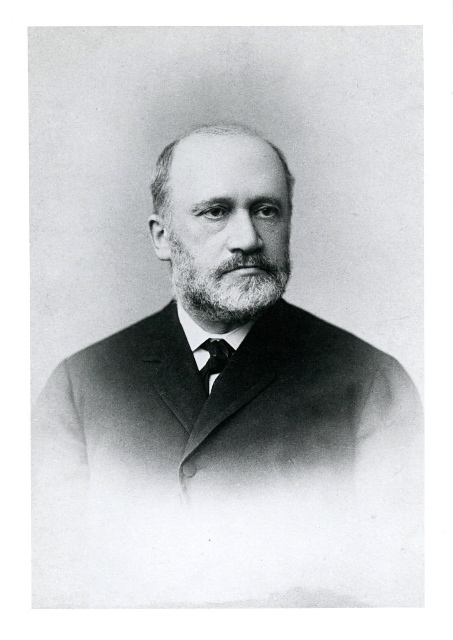 Eduard later went on to become a respected journalist and literary critic in Berlin and Rudolf became a renowned physiologist. Lili, however, suffered from multiple sclerosis and died when she was just in her twenties. 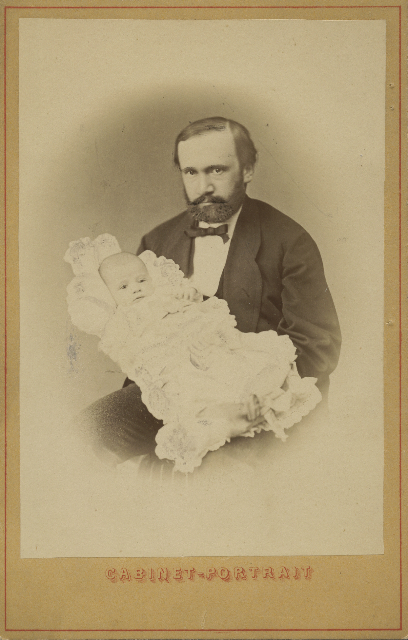 Anselm Höber holding his first son, Eduard, 1871. By the 1890s, Anselm’s sons were on their way to being well established in the world, but something went awry in Anselm’s business. At one point his income dropped so precipitously that Rudolf had to withdraw from the University of Erlangen where he was studying medicine. Rudolf was later able to return to school, but problems continue to plague Anselm’s business. In 1899, at the age of 67, Anselm killed himself. Anselm Höber shortly before his death in 1899.
Who knows why a person commits suicide? When I look at the old pictures of Anselm, I imagine that I sense some deep sadness in his dark eyes, some loneliness that haunts him even in good times. Am I just projecting that because I know what happened to him? Perhaps. Like many family tragedies, Anselm’s death was rarely discussed, and what I have written here is almost all that anyone today knows about him. His widow, Elise, lived quietly for another 15 years, dying just before the start of World War I. My great-grandmother, Elise Köhlau Höber, around 1910, some years after the suicide of her husband Anselm.